&checkmark; Using our web-based time clock reader gives you the freedom of not requiring a computer or additional equipment to send the time punches to your web-based account. Our Shift 2 Work time clock readers are preconfigured to connect to your online account so the time punch will automatically transfer directly without having to pull the information from a computer. All payroll hour reports and time card information is available in real time, online. If you are having trouble with password sharing, our fingerprint and facial recognition readers will eliminate employees from sharing their passwords. Your employees will have to be physically present to use their fingerprint or face image as their password to clock in and out. 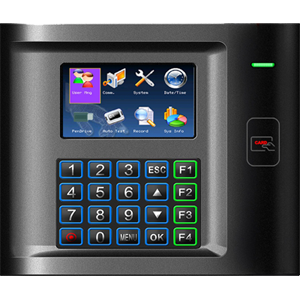 You can now have a time clock reader that has the functionality to be a fingerprint reader or a badge reader or a combo reader. We can configure the reader to use the functions you need. Simple and Easy. If you are concerned about time card abuse, we recommend using our biometric fingerprint reader function. Employees cannot share their password or give their badge to someone else to clock them in or out. They have to be present to register their time punch. New optical sensor technology has improved to read fingerprints faster and better than ever before. If using a badge is more convenient for your work environment, you can opt to use the badge function for fast, easy clock in and out. This time saving web based time clock reader device will make it super easy for employees to clock into work. The easy function keys can be used to track multiple projects, lunch and breaks with a click of a button. Our time clock reader devices are web-based and will connect directly to your Shift 2 Work account using the Internet. 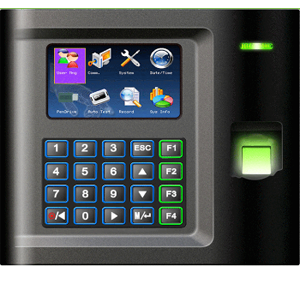 With a touch of a finger or a badge, the time clock reader will automatically transfer the time punch data directly to your online account without having to pull the information from a computer. All payroll timesheet reports and detailed time card information is available to view in real time using your computer, tablet, laptop or Smart Phone browser. Setting up the US10C biometric fingerprint reader is easy. Attach the reader to the backplate that is mounted on the wall, connect to your network internet and register the employee's fingerprints for each employee and they are ready to start clocking in and out. Our easy step by step instructions are included. Customer care representatives are always there to help you over the phone if you need any assistance. Warranty: There is a 1-year warranty on all time clock readers from the date of purchase, against manufacturer’s defects. Shift 2 Work offers technical support to help troubleshoot the issue to determine to either repair or replace the malfunctioning reader. This warranty will be void if the product has been damaged or impaired in any way, including but not limited to lightening, surge, water, or malicious damage. If you are in need of a repair for your reader please call technical support at 405-823-4842. Shipping: Free shipping is included with a NEW reader order within the continental US. Please allow 2-3 business days for delivery when placing an order. If order is received after 2pm CST your order will be shipped out the next business day. For shipping outside of the continental US, and special overnight shipments additional shipping costs will be charged. Returns: If within 30 days you decide you are not satisfied with your reader, you can return it back to us for a refund minus a 25% restocking fee. The equipment must be returned in “like new” condition with all parts and original packaging included. Any abuse or misuse of the terminal will void any refunds. After 30 days if the reader is in “like new” condition, we do offer a buy back option. Contact customer care for more details. Eliminating buddy punching is easy when using our facial recognition reader. Employees cannot share their password or give their badge to someone else to clock them in or out. They have to be present to register their time punch. This time clock facial reader is a time saving device the will make it super easy for employees to clock in or out of work. The new camera technology quickly identifies the individual and registers their time punch without having to touch anything. Our time clock readers are web-based and configured to connect directly through the internet to your Shift 2 Work account. The F300 facial time clock reader will automatically transfer the time punch data to your online account without having to pull the information from a computer. All payroll timesheet reports and time card information are available to view in real time using your computer, tablet, laptop or Smart Phone browser. 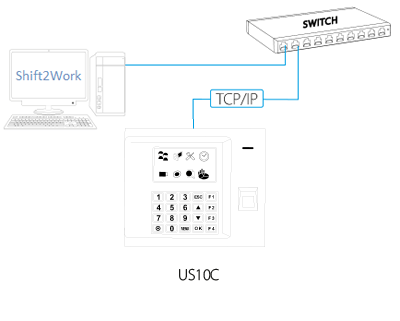 Our Shift2Work readers connect to the internet using either an Ethernet cable or your Wi-Fi network. The F300 time clock reader setup is easy. 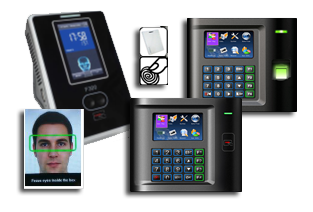 All is needed is to connect the reader to your internet network, register the face images for each employee and they are ready to start clocking in and out. Our simple step by step installation instructions are included. Customer service is available to help you over the phone if you need any assistance. Purchase separately from any computer store or online store. Warranty: There is a 1-year warranty on all web-based time clock readers from the date of purchase, against manufacturer’s defects. Shift 2 Work offers technical support to help troubleshoot the issue to determine to either repair or replace the malfunctioning reader. This warranty will be void if the product has been damaged or impaired in any way, including but not limited to lightening, surge, water, or malicious damage. If you are in need of a repair for your reader please call technical support at 405-823-4842. Returns: If within 30 days you decide you are not satisfied with your reader, you can return it back to us for a refund minus a 25% restocking fee. The equipment must be returned in “like new” condition with all parts and original packaging included. Any abuse or misuse of the terminal will void any refunds. After 30 days if the reader is in “like new” condition, we do offer a buy back option. Contact customer us for more details. Clocking in and out using a badge reader is a fast, efficient way to track your employee's time at work. Our time clock readers are web-based and will connect directly to your Shift 2 Work account using the Internet. The badge reader will automatically transfer the time punch data directly to your online account without having to pull the information from a computer. All payroll time sheet reports and time card information are available to view in real time using your computer, tablet, laptop or Smart Phone browser. Setting up the badge reader is easy! Attach the reader to the backplate that is screwed to the wall, connect the reader to your internet network, and register the badges to each employee and then they are ready to start clocking in and out. Our easy step by step instructions are included. Our friendly customer care representatives are available to help you over the phone if you need any assistance. Badges are sold separately at only $1.25 each. Warranty: There is a 1-year warranty on all readers from the date of purchase, against manufacturer’s defects. Shift 2 Work offers technical support to help troubleshoot the issue to determine to either repair or replace the malfunctioning reader. This warranty will be void if the product has been damaged or impaired in any way, including but not limited to lightening, surge, water, or malicious damage. If you are in need of a repair for your reader please call technical support at 405-823-4842. Clocking in or out using our Shift 2 Work badge is easy for your employees to use and a time saver. With just a wave of the badge in front of the sensor sends the time punch to the website. The reader will speak stating punch is accepted. We offer two styles of badges that fit your needs. EM-4100 series prox cards with a EM/Marin S.A. memory chip. a EM/Marin S.A. memory chip. Shipping: Separate order will be charged shipping. If you order badges with a reader order, shipping is free. Please allow 2-3 business days for delivery when placing an order. If order is received after 2pm CST your order will be shipped out the next business day. For shipping outside of the continental US, and special overnight shipments additional shipping costs will be charged.